Four days ago, as my wife and I walked up Meade just beyond Texas Street approaching Arizona, what should we see? 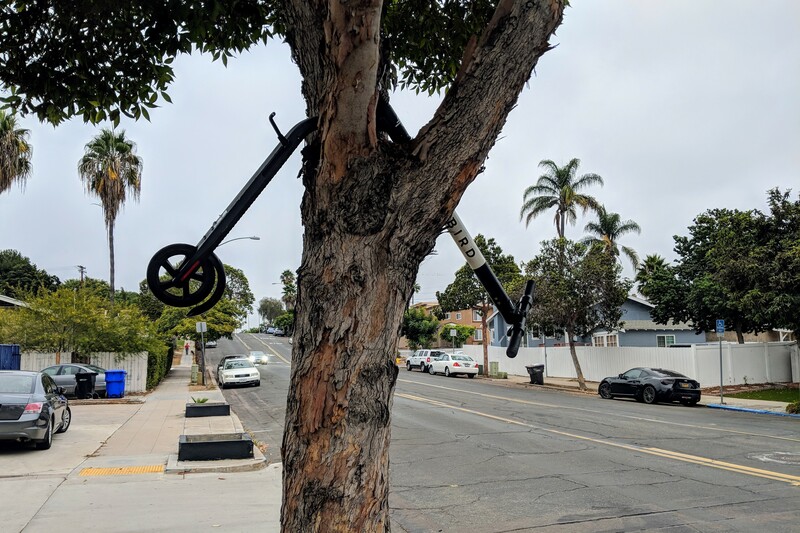 Scooters are everywhere in our neighborhood and nearby Normal Heights and North Park. I wonder who placed this one so and why. Did it not function properly? Is someone angry about the Bird (and Lime) invasion? Reasons aside, the treeing presented irresistible photo-op. Vitals for the Featured Image, captured using Google Pixel 2 XL: f/1.8, ISO 50, 1/266 sec, 4.459mm; 7:55 a.m. PDT.